It was the sabbath day and Jesus was at the synagogue. There he saw a man who had a withered hand. His right hand was useless and he could not do anything with that hand. 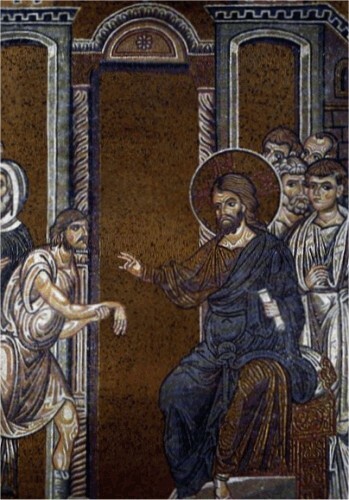 Jesus was going to heal him, but first he looked around at the Jewish leaders who were watching. They were hoping he would do something that they could accuse him of wrongdoing. Jesus knew their evil thoughts and their motives. He asked the man with the withered hand to stand up. Then he addressed the crowd and said, "Is it lawful on the Sabbath days to do good, or to do evil? to save life, or to destroy it?" The law of Moses forbade a person to work on the Sabbath day. The Jewish leaders considered healing to be "work" and therefore a breaking of the law. Jesus asks them "If any of you have a sheep and it falls into a pit on the Sabbath, won't you take hold of it and pull it out?" The men didn't say anything and Jesus looked at them with anger. They would have more compassion on an animal than they would on this poor man who was disabled by a withered hand. He told the man to stretch out his hand, and when he stretched out his hand it became whole and well the same as his left hand! This made the Pharisees, the Jewish leaders so angry they began to talk with each other about how they could destroy Jesus. They would continue to follow him around trying to find something they could use against him. The man needs to get to the post office before it closes. He has important letters that need to be mailed today. Let's describe the man. He is kinda fat, a lttle bit chubby. He has a bald head. Well, it's almost bald. He is proud of the 12 hairs he has on the top of his head! Every day he uses mustache wax on them and they stand straight up - with United States flags flying from each of them! In his crippled hand he carries 3 letters to mail, but he can't get them in the mailbox. His poor hand cannot stuff them in the box beside the door. What can he do? 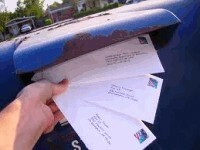 He goes over to the post office window and gives them to the postal worker. By the way, he has 6 more letters that are red, white, and blue in his hip pocket. There are five miracles recorded in the middle of the Galilean Ministry. (Miracles 8-12) This is a very busy and productive summer. He chooses twelve to be special helpers and the Bible calls them apostles. This is the ninth recorded miracle of Jesus. Thank you! The activites are great for the man with a withered hand!